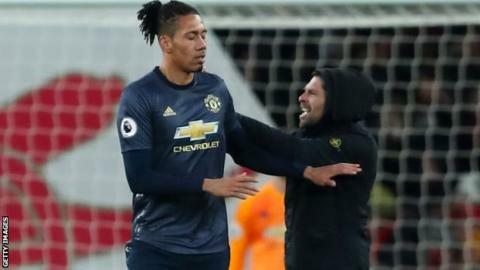 A fan ran on to the pitch and shoved Manchester United defender Chris Smalling during his side's away match against Arsenal at Emirates Stadium. The incident happened shortly after Pierre-Emerick Aubameyang had converted a 69th-minute penalty to give the Gunners a 2-0 lead against United. After pushing Smalling, the man ran with his arms aloft towards the Gunners players celebrating their goal. Smalling was unhurt and the fan was taken off the pitch and arrested. An Arsenal spokesperson said: "We utterly condemn the behaviour of the individual who ran on to the pitch and approached Chris Smalling during today's match. "We would like to apologise to Chris and Manchester United, and are pleased that [the spectator] was apprehended and arrested. We will be working closely with the Metropolitan Police in their investigation. "The individual will also be banned from Arsenal matches home and away. Our matchday staff receive ongoing training on managing incidents such as this." Shortly after the match, a statement from the Metropolitan Police said: "A man has been arrested on suspicion of common assault and pitch invasion following an incident during the Arsenal v Man Utd game at the Emirates Stadium today. Arsenal boss Unai Emery said the incident was something he "did not want" to see and called on all fans to show "respect". The incident came only hours after Aston Villa midfielder Jack Grealish was punched in the face by a spectator during Villa's 1-0 derby win over Birmingham City at St Andrew's. On Friday, a man was arrested after Rangers' James Tavernier was confronted by a spectator during Friday's Scottish Premiership draw with Hibs.